Guess I better get busy on the milling machine! I’ve been shirking my duties on keeping the blog updated so this has quite a bit of info. I cast a third head and it came out great. This one is heading out to Rebello Racing for one of his customers. So a whole lot has been going on behind the scenes as far as the processing of the raw castings and some big design changes. First the processing. 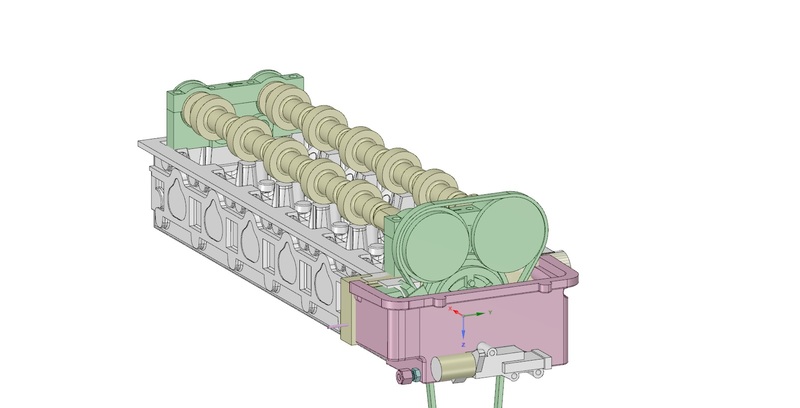 I’m always reading about casting and cylinder heads. 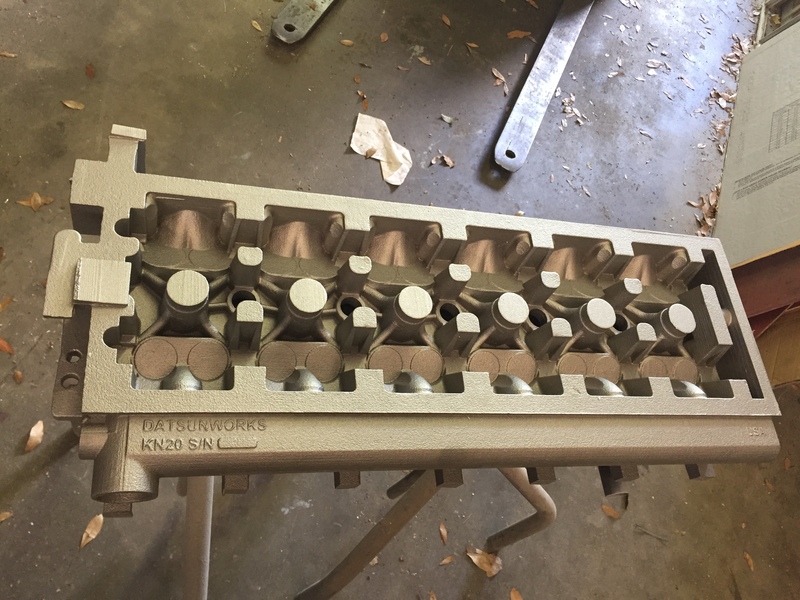 I was researching different methods of controlling casting shrinkage and porosity and stumbled across an article on how Edlebrock casts their racing heads. Not their production heads. 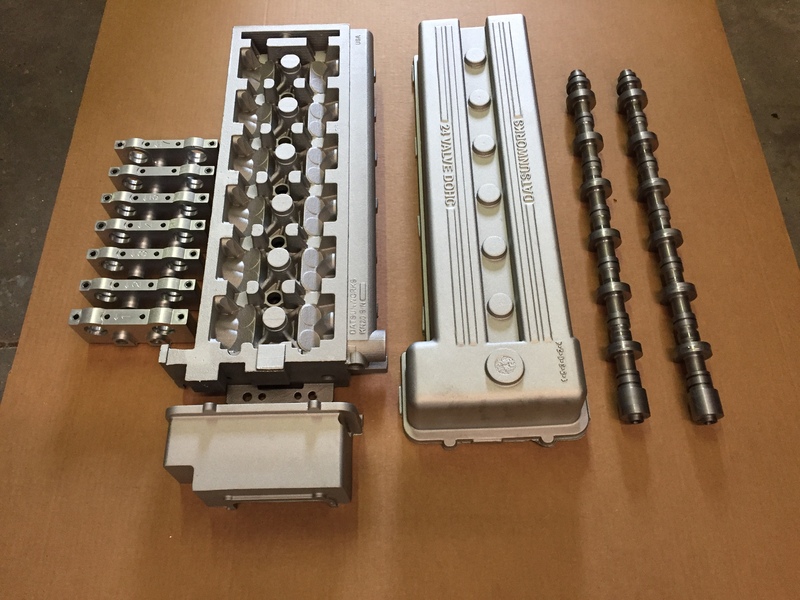 They mentioned that they offer an optional service called “Hot Isostatic Pressing” Or HIP. The HIP process consists of heating the casting to a set temperature in a pressure vessel and then pressurizing it to as much as 30,000 PSI. This basically compresses all of the porosity out of the metal. One comment from the article that stood out was it makes the casting almost as dense as billet. It’s so much denser that they had to adjust all of their machining speeds and feeds lower to accommodate the extra hardness. I’m now setup with a HIP provider and just had the last casting done. Because it’s a heat process the head needs to be heat treated afterwards. It’s currently at the foundry in the furnace as I type. I’m pretty excited about this since porosity is in every casting to some degree. You control it the best you can but there is always some. Going forward I’ll most likely forget about X-raying the castings since if there is a large amount of porosity it will show up as a depression or a complete blow. I’m also hoping to do away with resin impregnation since there should be no leaks. I’ll know better on that after I finish machining and do the pressure test. And now for the design changes. I have worked out how to implement Variable Cam Timing. This was no easy thing for sure but I’m all but certain it will work mechanically. The basic idea is I’m sticking with the KA24 lower chain and Idler. But I’m modifying the idler to accept a Honda K20 steel exhaust cam gear. This will allow me to run a shortened Honda chain and gears from a K20. Here is a picture of how that looks. The head has been made wider at the front, the valve cover is 1/2″ higher to accommodate the gears and the timing cover has been redone. It’s wider plus it has a solid section at the bottom front that will become the manifold for the VCT valve. 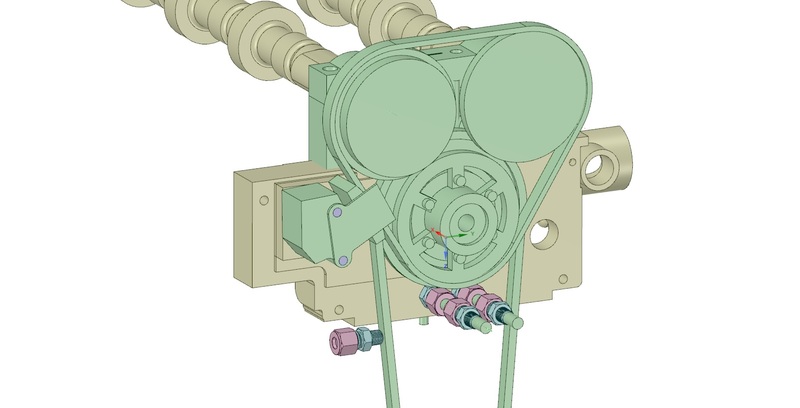 In the above picture you can see the oil inlet valve to the left and then the advance and retard circuits on the head. The Honda exhaust gear gets the center machined out and 6 5mm holes are drilled through. 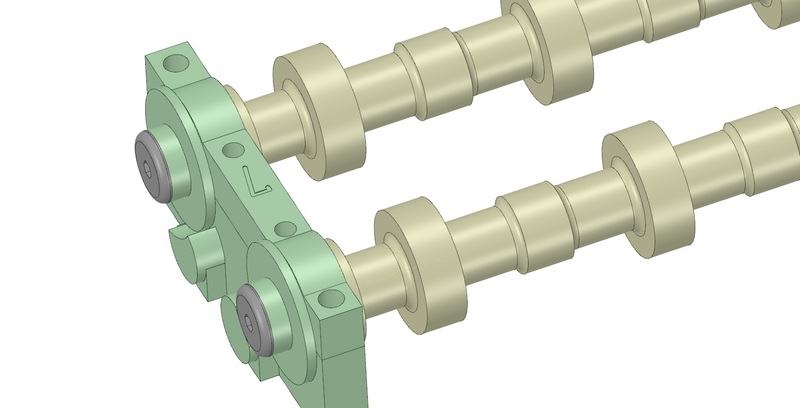 The KA24 idler gear will have the outer gear machined off to match the bore on the Honda gear and 6 5mm holes drilled and tapped to hold the two together. Here is the timing cover and VCT in place. 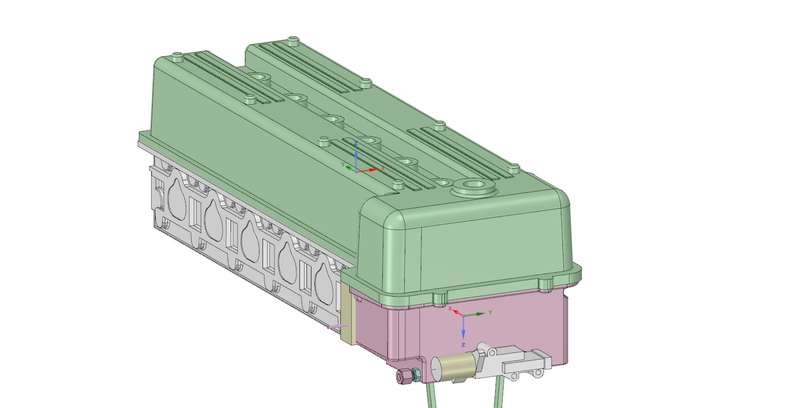 The VCT is from a V6 Nissan and should work fine as it has the same port sizes as the Honda. I’ve made the #1 tower wider to accept the grooving for the oil circuit. Since VCT and sequential injection require trigger wheels I redesigned the cams and rear tower. This is now the thrust area. It uses the stock Honda washers and bolts. The washers will work for Non VTC but will need to be customized for VCT and or sequential. I raised the valve cover up a half inch and then brought the plug valley back down a half inch since it has to be at a certain level. It actually looks better since the relationship between the cam cover and valley is more pronounced. I added bosses under the valley to accept screws for the the Honda COPs. There are two. One fro the wire pointing forward and one pointing rearward depending how you want it to look. Now for the nitty gritty. All of the castings and cam towers are currently sporting these modifications including the one I’m doing now. So I guess that officially makes it V3. 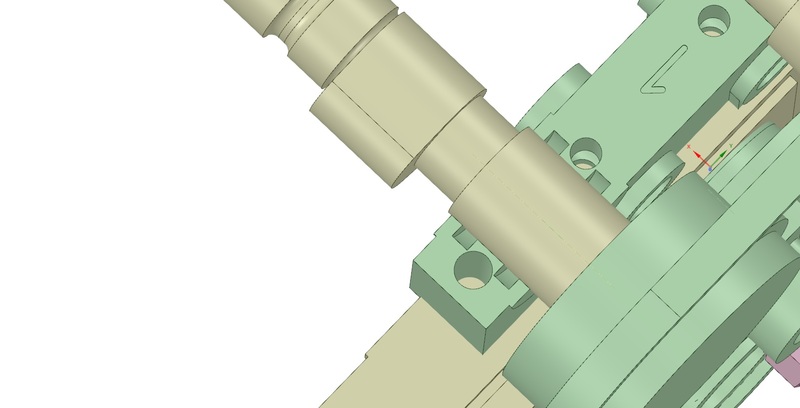 The non VTC cam shafts have been redesigned to work with the new towers but still use the KA24 upper timing set. If you want to convert from non VTC to VTC you will need new cams and all the other VTC specific bits. I have no plans at this time to actually make a running version of this myself. My main goal was to make sure that the parts I’m selling now will work with VTC if someone is brave enough to do it. My best guess is you are going to add 3-4 K by the time you have all of the bits working. There is a lot more to it than what you see here. ECU, sensors, plumbing etc. Not to mention I have no idea if the L6 pump will deliver enough volume to even make it work.